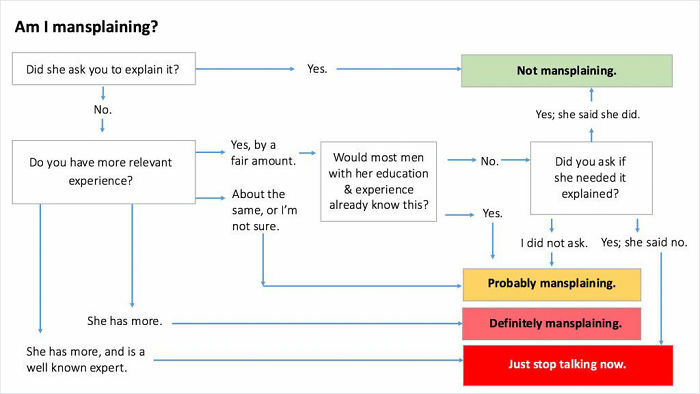 Ever wonder what the protcol is for explaining things to women, if you’re a man, without being accused of “mansplaining”? Er, yeah, Ms. Goodwin. I’m sure you did. 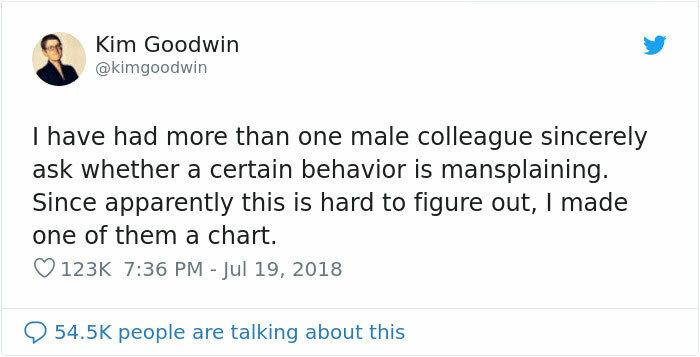 Apparently in Ms. Goodwin’s world, people grow infallible with experience, and should not be questioned by (male) underlings (no word if it cuts both ways – if a woman with less experience should “just stop talking now” when the guy outranks her? This entry was posted in PC, Privilege! by Mitch Berg. Bookmark the permalink. from her picture she doesnt have to worry about many guys mansplaining to her. Now, reverse the genders. Is the graph still true? Very handy. I may clip and save it to explain why I’m no longer interested in mentoring young female lawyers. Young male lawyers tend to accept mentoring because their primitive lizard brains recognize an elder imparting wisdom. They may not like it, but they put up with it. Young female lawyers tend to see an Old White Man who is Oppressing Them with Patriarchal Logical Reasoning, which is Insensitive and Uncaring to their Feelings about how they wish the law ought to be. And God help anybody whose eyes stray. I’m too old to start a new career because a well-intentioned effort is misinterpreted and unappreciated. Sorry if that has an adverse impact on your career, ladies. You can thank your shrill and bitter peers. – Feminists ask to be treated as men’s equals. – Men start to treat women as equals. When men explain things to men, we spend less time worrying about things like feelings, our tone, etc. – Feminists complain of “mansplaining”, ask for men to dial it down and treat them differently? Oh wait, I forgot that science is a white, patriarchal, oppressive structure that must be torn down. Judging by the picture, I would dare accuse the professor of mansplaining that to us…..
Erin Maye Quade: “Owning a gun is more dangerous than not owning a gun, and the “good guy with a gun” thing is complete fiction”. Erin Maye Quade: “I was a state representative, and I may well be the public safety commissioner soon”. BB: Galsplaining. Is that too offensive? How about chicksplaining?